In addition to the indicators listed above, twelve separate LEDs indicate that each SCR is receiving gate pulses. Current (Torque) Regulator - One percent accuracy armature current regulator allows the operator to control motor torque instead of speed. Field Current Regulator - Built in adjustable current regulator maintains constant field flux despite changes in motor operating temperature. Field Economy - Insures longer life for wound field DC motors. May be easily by-passed to meet specific application requirements. Full Four Quadrant Operation - Allows operation of the drive motor in both the forward and reverse directions while producing torque in either the clockwise or counterclockwise direction. Inner Current Loop Regulator - Inherent high band width capability for fast response. Isolated Control Circuitry - Provides complete isolation of the control and regulator circuitry from the AC power bus for protection in the event of a ground fault. The speed potentiometer and tachometer are not at line potential. Complete system compatibilities is also possible without additional isolation accessories. Jog Set at Preset Speed - Separately adjustable from zero to plus or minus 30% of base speed. Negative IR Compensation - Sometimes referred to as Current Compounding, enables this drive to operate in load sharing applications. This feature becomes available by jumper connection. Quadrant Lockout - May be selected by jumper programming to prevent forward nor reverse motoring in certain applications. Rectilinear Phase Control - Provides significantly improved performance at low speeds and near zero load. Separately Adjustable Linear Accel/Decel Control - Two ranges; 1.2-4 seconds and 2-30 seconds. Speed Regulator - Two percent accuracy using armature voltage feedback with IR compensation or 1% accuracy with DC tachometer feedback. Regulation may be improved by selecting the proper motor mounted DC tachometer. Solid State Full Wave Power Bridge - Uses generously rated power semiconductors for maximum reliability and long life. A 12 SCR back to back power bridge means better form factor, improved efficiency, better motor commutation and cooler motor operation. 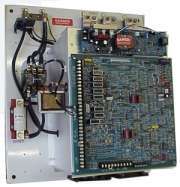 AC Line Connections - The MELLTRONICS 2300RG is completely insensitive to AC line phase sequencing. Common Control Circuit Boards - All MELLTRONICS 2300RG controls except the current feedback board utilize the same PC boards regardless of HP, voltage, frequency or control model. Dual Frequency Operation - Controls may be operated from 50 or 60Hz power supplies by simple jumper change. Exclusive Static Adjustable Current Limit - Allows static setting of the desired current limit value without applying DC power and without a connected output load. Remote Current Limit - Available by the simple addition of a potentiometer of DC voltage input. Standared Adjustments - Maximum speed, zero bias, acceleration time, deceleration time, IR compensation, current limit, jog speed, velocity stability, speed rate, and current stability. SCR Trigger Circuits - Pulse transformer isolated, hard firing, high frequency "burst" type pulse train output from individually grated oscillators insures SCR conduction regardless of the effects of line notching on the incoming AC power line. DC Armature Loop Contactor - Full rated and fully sequenced contactor assures positive disconnect of DC motor when the stop push-button is pushed or whenever an under-voltage condition occurs. DC Overload (Armature) - Senses over-current conditions with inverse time shutdown. Fault Trip Circuit - Protective circuits are designed to quickly shut the drive down whenever a drive fault condition occurs. A visual indication of the fault condition is provided and six TTL open collector logic level signals are available for remote fault indication. The fault trip circuit prevents inadvertent drive restart after a fault has occurred. It must be reset before the drive can run again. Field Loss Protection - Provides protection against runaway due to loss of motor field by shutting down the drive. Phase Loss Protection - Shunts the drive down to prevent damage to the control under single phase conditions. Heat Sink Thermal Switch - Prevents long-term thermal damage to SCRs due to loss of heat sink cooling fan. High Speed Current Limiting SCR Semiconductor Fuses - Provides the utmost in fuse coordination and protection of the SCRs and motor with positive circuit clearing on both AC and DC faults. Instantaneous Overcurrent Protection - Senses armature fault currents quickly to protect both semiconductors and motors against damaging current levels. Reactors, Snubber Networks - Prevents interaction and SCR DV/DT failures, due to line spikes and transients. Provides DI/DT protection during SCR turn-on and aids in SCR turn-off during SCR commutation, thus minimizing the effects of AC power-line notching. Severe system applications may require additional electrical equipment to insure proper control operation. For further information, consult the Melltronics Industrial Service Department. MODEL A B C D E F G DIA WT.-LBS.